And observed to be a gardener in the land of Eden. Christos was born in Albania. When he was forty years of age, he traveled to the queen of cities, Constantinople, and there became a gardener. One day, as he was selling apples in the marketplace, he agreed to sell a Turk all of his apples. But then an argument ensued between them about the sale price. The vengeful Turk, out of malice, slandered the Christian. He charged that Christos wished to become a Muslim. The Turk, thereupon, not only forcibly brought Christos before the judge but also furnished false witnesses before the court. They attested that Christos truly wanted to become a Muslim. The judge questioned the defendant concerning the allegation. He answered with great courage, "I am a Christian. I never uttered any such thing about converting to Islam. It is impossible for me to abandon my Orthodox faith, even though I should suffer a thousand evils." Following this court scene, the judge ordered that the Martyr be severely flogged. Thereafter, they bound him and dealt him a blow to the head, which caused heavy bleeding. 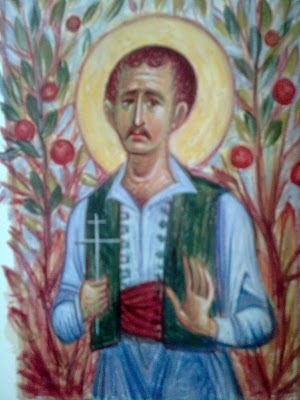 Christos was sent to the jail, where his feet were pressed in the stocks. 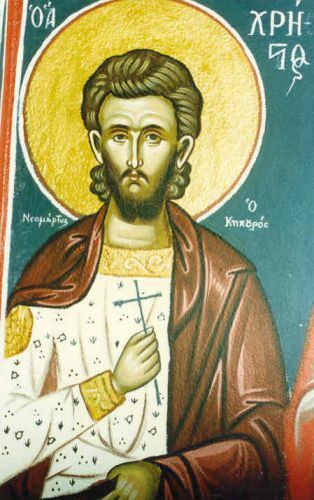 At that time the learned Monk Kaisarios Dapontes happened to be in that jail for political reasons (It was he who recorded this martyrdom.). When he beheld the Martyr in that wooden vise, he attempted to comfort him. The Monk succeeded in somehow secretly freeing Christos from the vise. He offered Christos food, saying, "Partake and strengthen yourself." The Martyr shook his head, having no wish to partake of it, saying, "Why should I eat? I do not expect to live. Therefore, I might as well die for my Christ hungry and thirsty." The Martyr gave the Monk a metal file, which he had in his belt. He begged him to offer it to the Church, so that the priests would perform Divine Liturgies and commemorate him after his death. That very same day, the Turks removed the Martyr from jail and struck off his head. 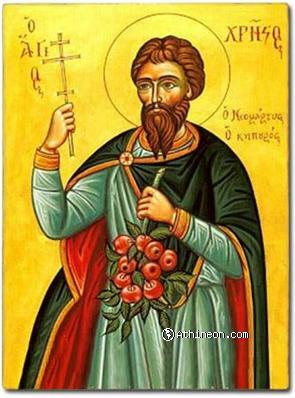 Thus, the blessed one received the crown of martyrdom on the 12th day of February, in the year 1748. Glory be to Jesus Christ to the ages! Amen.